Time for some reviews and write ups from our trip to Tokyo. Both Gio and I happened to be heading to Tokyo at the same time (vacation for me, work for him) so we had to grab all the ramen we could! One of my absolute favorite places is Kohmen Ramen. They have several chains around Tokyo of which we usually go to the one in Harajuku or Akihabara (top floor of Yodobashi Camera). 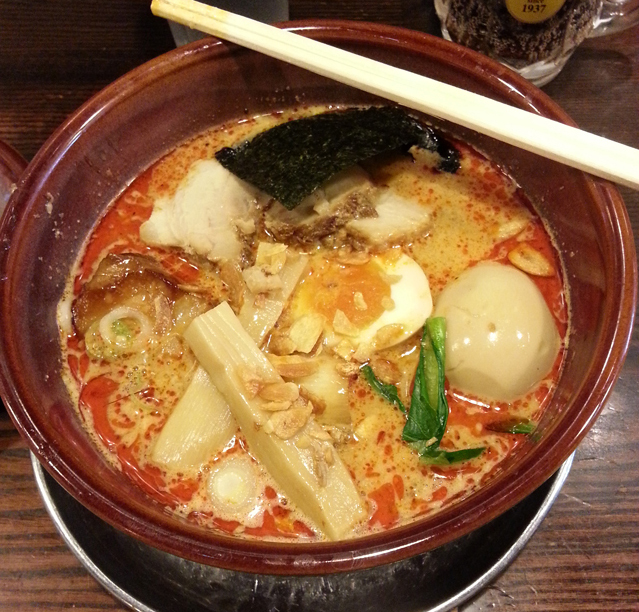 Hands down one of my all time favorite ramens is Kohmen’s Tantanmen. I have to have it every time we are in Japan and can’t leave without it. A szechuan style dish, the standout here is the amazing spicy sesame broth and roasted pork. I choose to order the “deluxe” version which comes with extra toppings on the side that you add to the bowl. The toppings include green onion, roasted garlic, bamboo shoots, seaweed, 1/2 a seasoned egg, seaweed, cayenne pepper strings, and bok choy. The cubed roast pork and thinly sliced chasu compliments everything well and the toppings were fresh and crunchy. The noodles were cooked perfectly and soaked up the spicy chili oil which each loud slurp. If you are ever in Tokyo I highly recommend making a trip to any of Kohmen’s locations. The open kitchen adds an awesome atmosphere to the fantastic food. The price also makes this a no-brainer at just shy of $11 for a “deluxe” size ramen. In the ongoing quest to eat all the ramen there is we often return to our favorite spots. 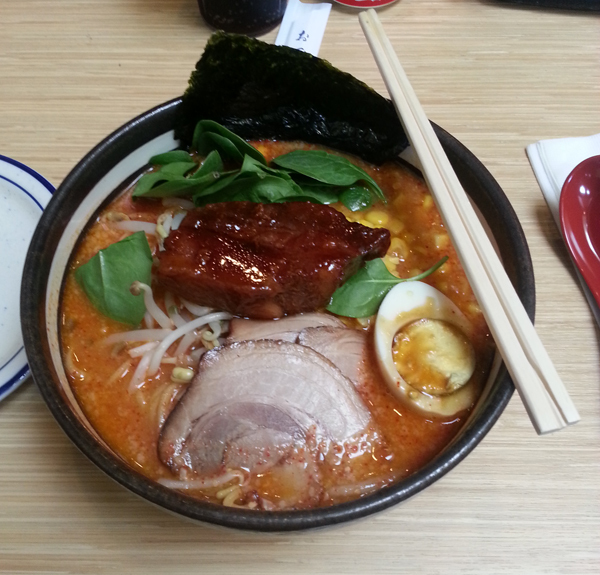 Being privileged enough to work in the San Mateo area we have an awesome selection of quality places serving Ramen. My favorite of these is Santa Ramen just south of the Hwy 92/El Camino Real intersection. Both Gio and I have reviewed dishes from here before and LOVED them but neither of us had tried the dish they are most famous for, the Stewed Pork Belly ramen. When ordering the dish you have 4 broths to choose from which include soy sauce, miso, tonkotsu, and garlic tonkotsu. Each broth comes with a specific topping that compliments the broth flavors. I choose to go with the Miso broth, extra spicy. Toppings for the dish as chosen are pork belly, chashu, bean sprouts, baby spinach, 1/2 an egg, roasted seaweed, and the miso specific sweet corn. The bowl arrived shortly after ordering, which for how busy they were was a nice surprise, and looked fantastic. The toppings were all neatly placed in the bowl so that you could see everything. The contrasting color of the bright green spinach with the red spicy broth was really nice. The chashu was cut perfectly and the pork belly glistened right front and center. As with every ramen I eat the first taste was a nice slurp of the broth. The broth has rich and heavy with a perfect amount of spice. The nuttiness of the miso stood front and center and was exactly what I would want from a miso broth. So far this has been one of the best miso broths I have had here in the states (more coming on that in a later review/write up). The pork belly was some of the best I have ever had and was perfectly cut with just the right amount of fat to meat. Stewed then either braised or grilled (hard to tell) it had a sweet porky flavor that complimented the spicy miso wonderfully. I wish there was more as I goobled the one piece up really quick. The chashu (which we have mentioned before) was fantastic and a nice juxtapose to the sweeter fatty pork belly. Salty and roasted it had a fantastic grilled flavor to it. The noodles were nicely cooked with just the right amount of firmness to them. Portion size was also just right. As for the other toppings everything was spot on. Fresh and crunchy the veggies added a nice flavor range to the other heavy stand outs. Again I can’t rave enough about Santa Ramen and the dishes they offer. Between the 2 of us we have sampled pretty much everything they make and will be going back again and again. Just make sure you get there early as the line grows quite long by the time noon hits.